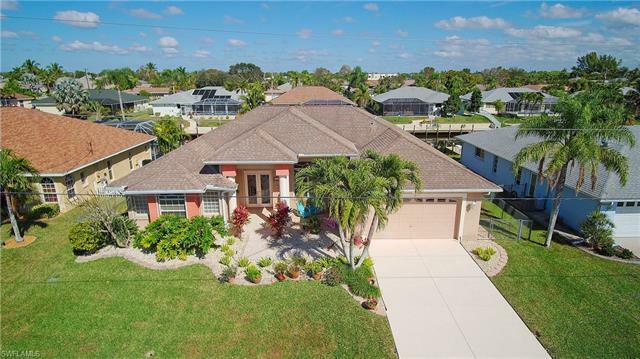 Enjoy your own tropical oasis in the desirable Pelican neighborhood of Cape Coral! Bring your boat and move right in to this gulf access pool home complete with 10, 000 lb. boat lift and walk around dock. Sliding doors line the back of the home creating the perfect indoor-outdoor living experience and nearly unobstructed views of your canal. Lounge on your spacious lanai with newly coated pool deck or take a swim in the heated pool any time of the year! The open concept floor plan boasts a light and bright kitchen with Corian counter tops, tile back splash, white cabinets, a built-in desk, stainless-steel GE Profile appliances, convection oven & microwave, huge breakfast bar, and a large pantry. The triple split floor-plan provides plenty of functionality and privacy for guests. The large master suite features sliders leading out to the lanai, double walk in closets, and a private master bath with walk in shower and jetted tub. Additional features include: Bose surround sound speakers, speaker pre-wire on lanai, large laundry room with washtub, electric roll down hurricane shutters on all windows/doors/lanai, travertine front porch and walkway, generator with sub panel, & more!